This 41-year-old female presented to clinic with continued pain and swelling in her left fifth finger. She reported an extensive history of injuries to that finger over the last 20 years. 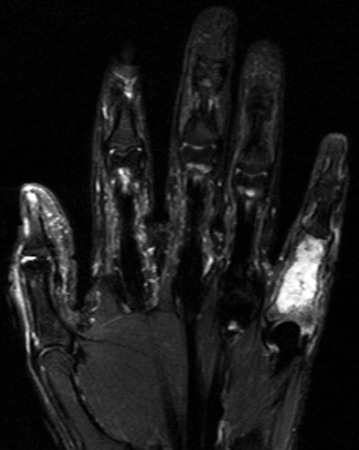 The patient’s MRI, illustrated below, revealed a lesion in the proximal phalanx of the left fifth finger which was confirmed as an enchondroma by subsequent surgery. 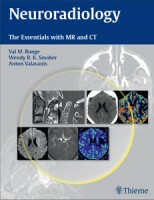 Scans were acquired on a 3 T Siemens Trio Tim MR unit. 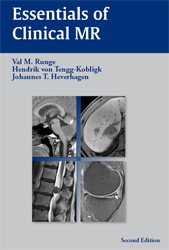 (A) Coronal pre-contrast turbo spin echo fat-suppressed T2-weighted (TR/TE 4000/67 ms, scan time 3:32 min:sec) images were obtained as well as (B) coronal spin echo T1-weighted (TR/TE 750/11 ms, scan time 2:38 min:sec) and (C) coronal post-contrast spin echo fat-suppressed T1-weighted images. Slice thickness was 2 mm in each instance. 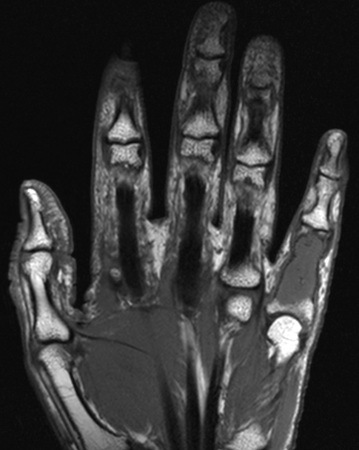 The MR examination reveals in the proximal phalanx of the fifth digit an approximately 2.8 x 1.1 cm lesion exhibiting fluid-like signal intensity. 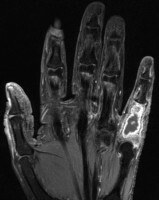 The lesion is well-circumscribed by overlying bony cortex and predominantly involves the diaphysis with sparing of phalangeal base but extent to the epiphysis distally. Uniform peripheral enhancement is seen without evidence of associated soft tissue or bone marrow edema.